Figure 16.1. sFLC concentrations in patients with NSMM compared with normal individuals and patients with LCMM. ● Clinical case history 1. Figure 16.2. 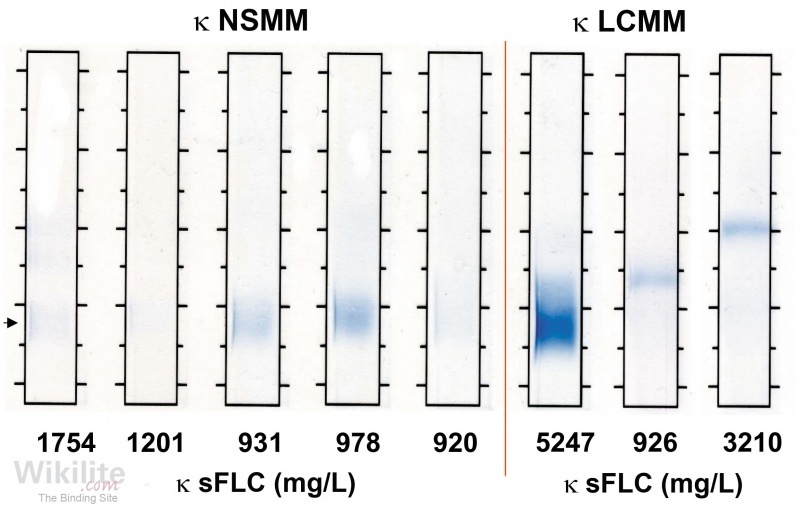 Serum IFE from five patients with κ NSMM and three patients with κ LCMM. Samples were applied at similar FLC concentrations. Figure 16.3. Size-separation gel chromatography showing the FLC size variation in a serum sample from a patient with NSMM. 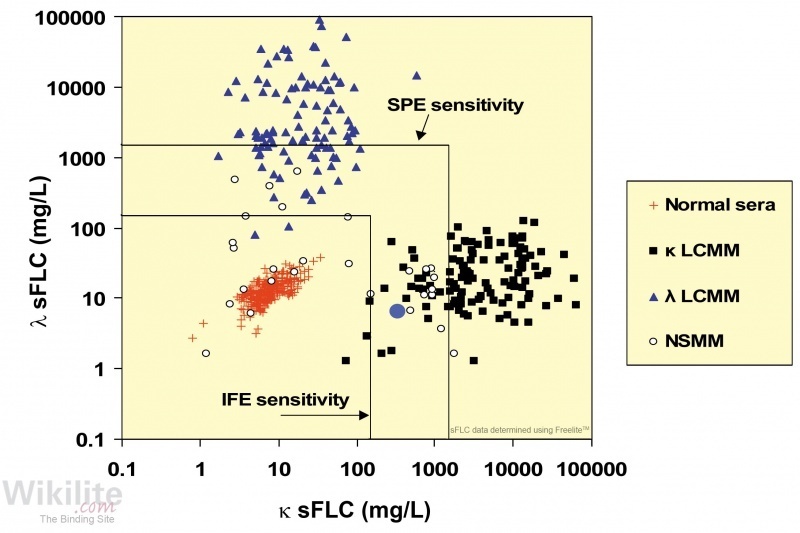 The sample contained 1754 mg/L of κ FLCs by Freelite® immunoassay but was negative by SPE and IFE (Figure 16.2). The above arguments suggest that sensitive assays for sFLCs might detect monoclonal proteins in a proportion of patients with NSMM. The results from a large study are shown in Table 16.1 . Archived sera were obtained from patients studied in MRC MM trials undertaken in the UK between 1983 and 1999. Of 2323 patients, 64 (2.8%) were diagnosed with NSMM and, of these, 28 were selected for study based on the availability of complete clinical records and the appropriate stored serum samples. In all patients, concentrations of κ and λ sFLCs were compared with results from SPE and IFE tests. The results showed that 19 of the 28 sera had abnormal κ/λ sFLC ratios and elevated κ or λ sFLC concentrations. A further four samples showed abnormally low levels of one or both sFLCs. sFLC concentrations in the remaining five samples were substantially normal (Figure 16.1 and Table 16.2). BMPC: bone marrow plasma cell; Hist: immunohistochemical confirmation of MM; IFE +/-: weak diffuse bands; IFE +: weak narrow band; BJP +/-: low concentrations of urine FLCs; ND not detected; *trephine biopsy +ve for MM. Table 16.1. sFLC concentrations in 28 patients with NSMM . Serum reference intervals were the 95% ranges in use at the time of publication. Careful repeat testing of the 28 sera by IFE, using optimal sensitivity (Table 16.1), showed monoclonal sFLCs in six, but the monoclonal bands were mostly weak and diffuse. Rather surprisingly, in nine of the 28 patients no monoclonal bands were seen using IFE even though the immunoassays indicated sFLC concentrations of >200 mg/L. In many of these samples, the elevated FLC concentrations should have been easily detectable by IFE. IFE gels from five of the serum samples containing high concentrations of κ sFLCs are shown in Figure 16.2 . These are compared with three samples from patients with typical κ light chain multiple myeloma (LCMM). The sFLCs in the NSMM samples failed to focus into the same narrow monoclonal bands seen in the LCMM sera. 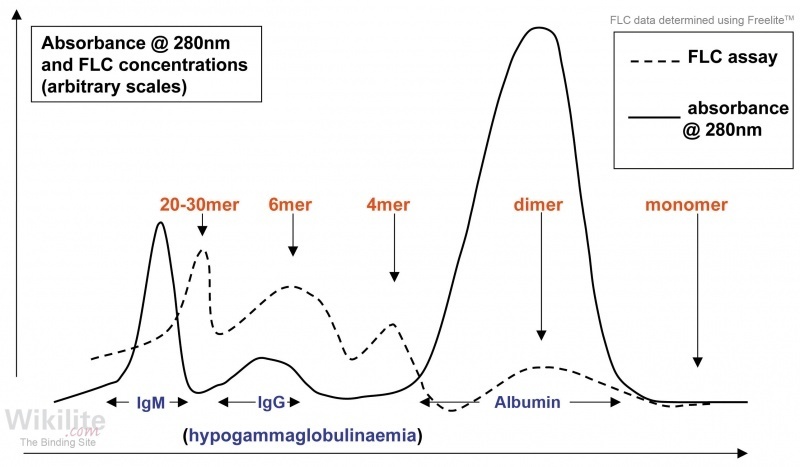 Two sera from NSMM patients with substantial concentrations of sFLCs measured by nephelometry (980 mg/L and 1700 mg/L), were subjected to size-separation gel chromatography and found to contain highly polymerised FLCs (40 - 200 kDa) (Figure 16.3). This suggested that variable polymerisation caused the monoclonal bands to smear on the SPE gels and this could account for their absence or diffuse appearance. Such large polymers would have minimal renal clearance compared with monomeric FLCs. Good renal function would be maintained (typical of these patients) and little FLC would enter the urine. These observations concur with other reports that describe polymerised or structurally abnormal FLCs in some patients with MM (Section 7.6) . Of additional interest, it was found that diffuse bands were more common in κ FLC-producing patients (Table 16.1). Hence, λ patients with low FLC production are more likely to produce discrete monoclonal bands and be classified as “secretory” LCMM. At one time, the lack of λ NSMM led to the suggestion that such patients may not exist. Moreover, the observed higher frequency of κ FLC polymerisation probably explains the 4:1 ratio of κ to λ NSMM patients reported in the literature . There have only been two other large studies of sFLC measurements in NSMM. Chawla et al. found an abnormal κ/λ sFLC ratio in 19/29 (65%) NSMM patients at diagnosis, and concluded that overall survival was worse in patients with an abnormal sFLC ratio at baseline compared to those with a normal ratio, similar to findings for MM patients in general (Section 20.2). Migkou et al. reported an abnormal κ/λ ratio in 14/17 (82%) of patients at diagnosis, and nine of these had an involved FLC (iFLC) ≥100 mg/L, which exceeds the threshold required to assess haematological response in clinical trials (Sections 16.3 and 25.3.5). Other reports have confirmed the diagnostic sensitivity of the sFLC ratio in smaller groups of NSMM patients. Cavallo et al. reported that four of five NSMM patients had abnormal FLC concentrations. Most recently, Jeong et al. found abnormal κ/λ sFLC ratios in two NSMM patients with normal serum and urine electrophoresis and immunofixation results. They commented that a combination of SPE and sFLC analysis was effective in screening for monoclonal gammopathies, including NSMM (Chapter 23). Whilst elevated sFLC concentrations are found in a high proportion of patients conventionally thought of as non-secretory, normal sFLC results can be indicative of true non-secretory patients or non-producing patients. Papanikolaou et al. reviewed flow cytometry data for 210 NSMM patients and identified 19 that had no cytoplasmic immunoglobulin detected. sFLC analysis of these patients revealed normal sFLC ratios for 18/19, demonstrating concordance with the flow cytometry results. In the one patient with an abnormal sFLC ratio, elevated sFLCs were attributable to grade 3 renal failure. Application of the renal reference interval for the κ/λ sFLC ratio may aid interpretation of results in such cases (Section 6.3). Ma et al. also reported a true ‘non-producing’ NSMM patient in whom normal sFLC results were in agreement with electrophoretic and immunohistochemical analysis. The widespread routine use of sFLC immunoassays has made the identification of true NSMM even rarer than previously observed, with a frequency in the order of only one in 200 myeloma cases .